A charming city on the sea, surrounded by the impressive Karstic plateau. The old city center has a rich historic and artistic repertoire like the Arco Riccardo (arch), the Roman Theatre, the Cathedral of San Giusto (14th Century) with mosaic decorations and San Giusto Castle. Piazza dell'Unità d’Italia is extremely charming with its Austrian imprint. 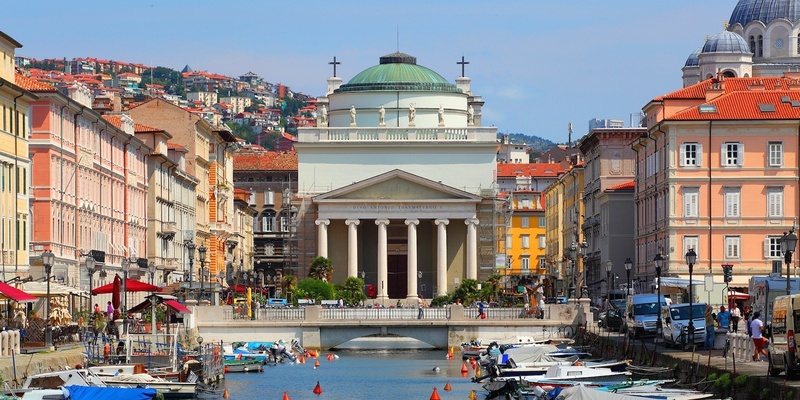 It is surrounded by neoclassical buildings, with one side of the piazza facing the sea. 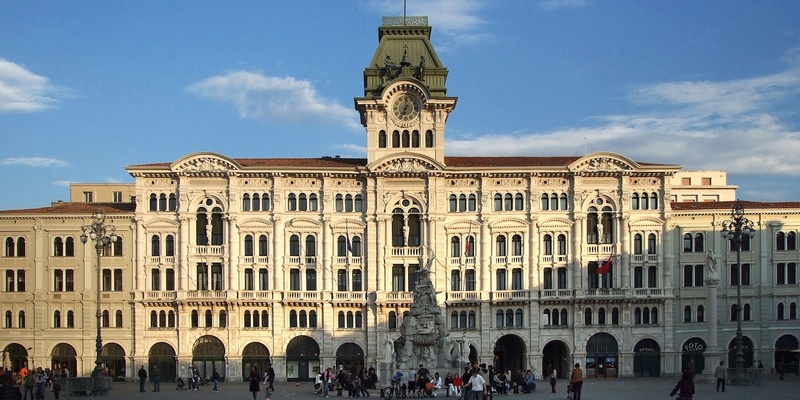 Trieste is a city that speaks to the visitor with its monuments harking back to different periods, characteristic old coffee shops where lovers of literature and writers have long met, the harbor and the impressive examples of Art Nouveau architecture. The Faro della Vittoria is unmissable: it is an impressive lighthouse on the Gretta Hill, a modern monument constructed with the white rock of Orsera and dedicated to the fallen of the First World War. The vintage Tram of Opicina lies along a rather panoramic route, and it connects the center of Trieste to Villa Opicina as it climbs the Karstic plateau along impressive inclines, allowing for spectacular views onto the gulf and the city. 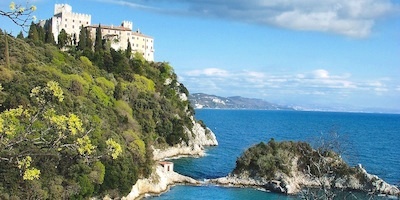 And along the coast, one can admire three antique castles, located in amazing panoramic positions: the Duino Castle, surrounded by a big park with terraces and walkways; the wonderful Miramare Castle - made with the white rock of Istria - overhanging the sea, near Trieste and the Muggia Castle, in the picturesque small town of Muggia located in the Italian part of Istria, facing the sea. Then, Muggia is a source of surprises for its visitors: the city center boasts Venetian influences, complete with calli (narrow streets) and campielli (small squares), and a majestic cathedral. Moreover, it is a renowned tourist resort, perfect for a relaxing beach holiday; Porto San Rocco is an inviting and modern touristic harbor. Baia Sistiana is considered one of the best beaches of the area, and Duino - with rocks overhanging the sea - hosts charming destinations for beach vacations. As far as naturalistic attractions, the Grotta Gigante is well-worth a visit. It is considered the biggest hypogeal karstic cave, with many stalactites formed by the steady trickle of water over time. A tour of the karstic inland leads to characteristic small towns the likes of Monrupino - with its fascinating fortress - and Rupingrande, with its characteristic Casa Carsica, an ethnographic museum displaying costumes, tools and typical rural furniture. Prosecco, Samatorza, San Dorligo della Valle: these are just some of the small villages in the Karstic plateau, with their characteristic stone houses and their osmize, small and cozy restaurants ideal for tasting local wines and specialties.